Harris Dickinson (born 24 June 1996) is an English actor, writer, and director. 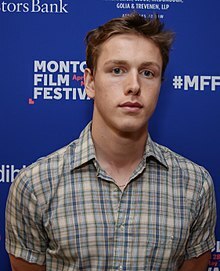 He is known for his portrayal of Frankie in the 2017 film Beach Rats, for which he was nominated for Independent Spirit Award for Best Male Lead, London Film Critics Circle Award for Young British/Irish Performer of the Year, and for the Gotham Independent Film Award for Breakthrough Actor. In 2018, Dickinson portrayed kidnapped heir John Paul Getty III in the first season of the Danny Boyle-helmed FX drama series Trust. He played Liam Stewart in the science-fiction film The Darkest Minds (2018) and will play Prince Phillip in the upcoming film Maleficent: Mistress of Evil (2019). Dickinson was born and raised in Leytonstone, East London. At seventeen, he dropped out of school, where he was trying to study film and theatre. Dickinson almost opted for a career in the Marines, before being convinced to return to the theatre by his coach at RAW Academy in London. Dickinson commented that a lot of people choose not to follow their passions "because they're scared, or don't have the support network." In 2016, Dickinson was cast as Frankie in Eliza Hittman's film Beach Rats, about a young man struggling with his sexuality against the Coney Island boardwalk. For his performance, Dickinson was nominated for the Independent Spirit Award for Best Male Lead and the Gotham Independent Film Award for Breakthrough Actor. ^ a b "2018 Independent Spirit Award Nominations: 'Get Out' and 'Call Me by Your Name' Dominate". Indiewire. 10 October 2017. Retrieved 14 November 2017. ^ a b Gettell, Oliver (November 27, 2017). "Call Me By Your Name takes top prize at 2017 Gotham Awards". Entertainment Weekly. Retrieved November 27, 2017. ^ Herman, James Patrick. "Verge List: Sundance 2017 – Harris Dickinson". Verge. Archived from the original on September 19, 2017. Retrieved December 2, 2017. ^ a b Heller, Nathan (August 23, 2017). "Harris Dickinson, Star of Beach Rats, Eases Into the Spotlight". Vogue. Retrieved August 23, 2017. ^ Mills, Jack. "Dazed 100: Harris Dickinson". Dazed. Retrieved 24 August 2017. ^ Luers, Erik (November 27, 2017). "Nominations Announced for 27th Annual IFP Gotham Awards" (Press release). Independent Filmmaker Project (published November 28, 2017). Archived from the original on December 1, 2017. Retrieved November 28, 2017. ^ "2018 Independent Spirit Award Nominations: 'Get Out' and 'Call Me by Your Name' Dominate". Indiewire. 10 October 2017. Retrieved 14 November 2017. Wikimedia Commons has media related to Harris Dickinson. This page was last edited on 7 March 2019, at 11:39 (UTC).